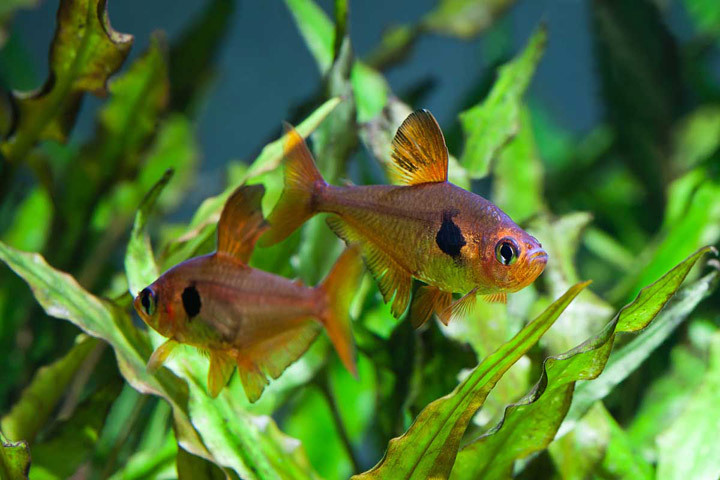 Tetras make up the most popular groups of fish for small freshwater home aquariums. They are the most requested fish because you can get a large variety of colorful active and hardy Tetra fish types, and have them all in a freshwater aquarium full of other tank mates. They are inexpensive, friendly, easy to feed and are easy to care for. At a price of $2-$10 per fish, they are very affordable. A small school of the inexpensive variety would cost you less than $10! 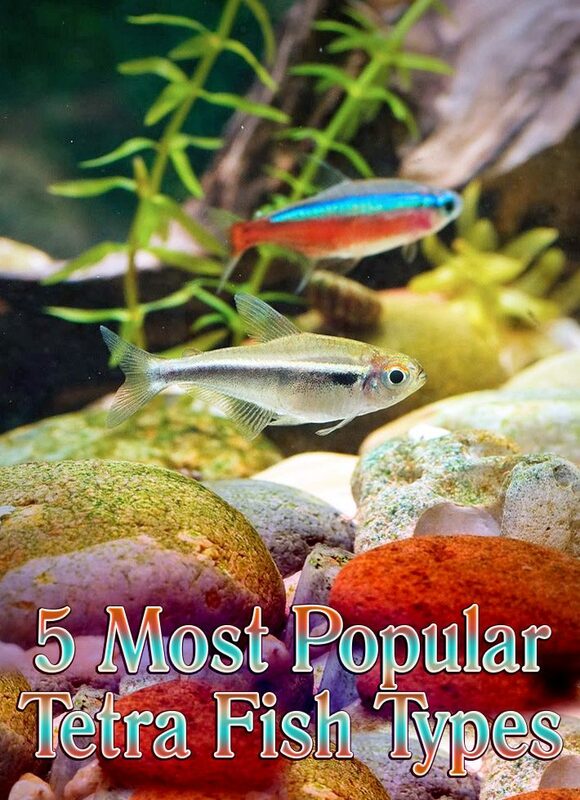 In order to choose the right Tetra fish types for your tank, here is a little more information about the 5 most popular Tetra fish types. Neon Tetras originate from the Amazon in South America. They are very harmonious omnivores, and are compatible with other docile fish. They come in a beautiful mix of colors like red, white, blue, silver and black. They have a long life span for a Tetra fish; they can live up to 5-10 years! Having live plants in your tank is strongly recommended to in order to keep your Neon Tetras happy – they love having places to hide. Since they enjoy being in a school, and will only grow to about 1.5 inches long, you should buy them in groups of 5 (for a 10 gallon tank) and groups of 10-12 (for a 55 gallon tank). If you keep too many Neon Tetras in your tank at once, they could get stressed out and develop diseases. The brilliant colors of this characin make it one of the most popular aquarium fish but it’s important to know that the Cardinal Tetra is not one of the easiest Tetras to keep. You will need soft water, slightly acidic conditions and a mature tank with well-established thickets of plants to provide shelter. It is well worth saving up to buy a shoal of these fish. 1-3 Tetras will tend to hide, but they will gain strength and beauty in numbers and will also look far more impressive in groups. The vast majority of Cardinal Tetras offered for sale are wild-caught and highly sought-after community fish. Although they are a community fish, they are small in size (1.5 inches) and may get eaten by larger tank-mates so be sure to place them with other peaceful fish mates. 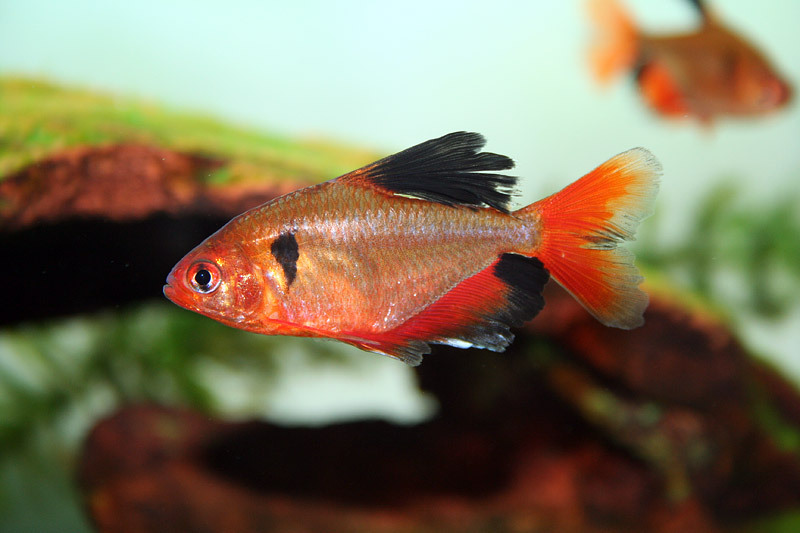 Serpae Tetras come in beautiful solid bright red colors. They are also commonly called the Blood Tetra and the Red Minor Tetra. They will do well in soft, neutral to slightly acidic water. They will not get any bigger than 2 inches and they come in many different hybrid species, such as the long fin version. They are available in local pet stores, are easy to keep. Make sure you keep them in groups of 5-6 or preferably much more. Like most Tetras, they will do better in well-planted tanks that provide shelter and hiding spots. One small disadvantage of owning the Serpae Tetra is that they are known to be fin nippers. If they have a heavy planted tank and a big school, they won’t nip other tank mates as much. If you’re thinking about owning a Serpae Tetra, you will need to stay away from having other fish in the tank with long and flowing fins. Diamond Tetras are very active and they do not tend to chase or nip at any other fish. They are a beautiful fish due to the opalescent shine of their scales. They appear to sparkle like diamonds with their green, gold, orange, silver and violet scales. Their full color will not appear until they are adults, so you might have to be patient for a while before you see their true beauty. They prefer soft, slightly acidic and peat filtered water. They are very hardy and have a lifespan of about 3-6 years. Since they are so active, they will need to be well fed. Like other Tetra fish types, Diamond Tetra are a good and peaceful community fish that prefer to be in a school of 5 or more. The Glowlight Tetra is another beautiful fish from South America. They have bright iridescent red and orange colors and stripes from the eye to the base of their tails. Watching their iridescence and semi-transparent bodies swim together when they are shoaling is a beautiful sight to see. 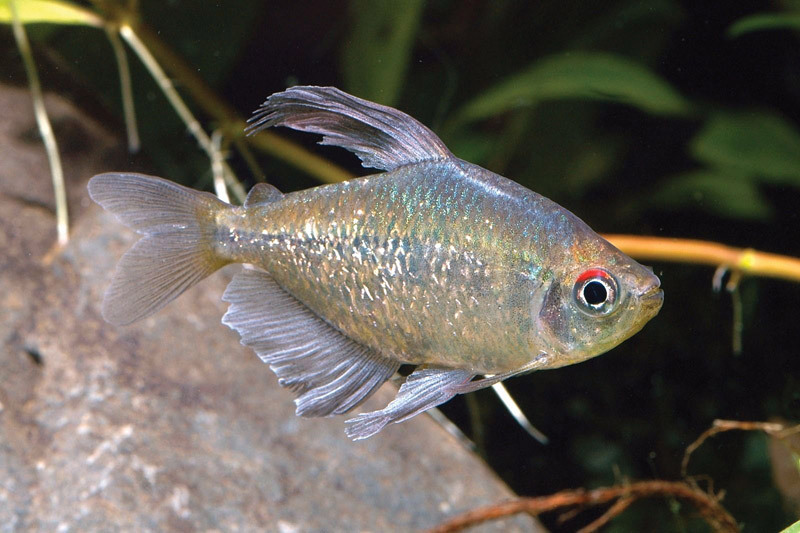 They have a shorter lifespan (3-5 years) than the Neon and Cardinal Tetras. They also do well when placed in groups 5 groups or more. They will need slightly acidic water with medium hardness. Since they are sensitive to fluctuations in pH, temperature, nitrate and nitrite, they should only be kept in a tank that has consistent biological filtration. It would be a good idea to keep your Tetras away from the main tank until water conditions are stable. They are a peaceful fish and should be kept with docile fish of similar size.